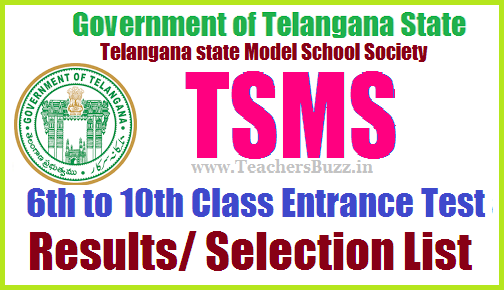 TSMS Telangana Model School 6th/7th/8th/9th/10th classes Entrance Exam Results ,Merit List 2019. #TSMS 6th Class Entrance test Results , Merit list 2019, TS Model School Society , telangana. Rashtriya Madhtamik Shiksha Abhiyan- TSMS CET 2019 for admission into Sixth Class in Telangana Model Schools for the academic year 2019-20 merit list. TS Model Schools entrance test results 2019. 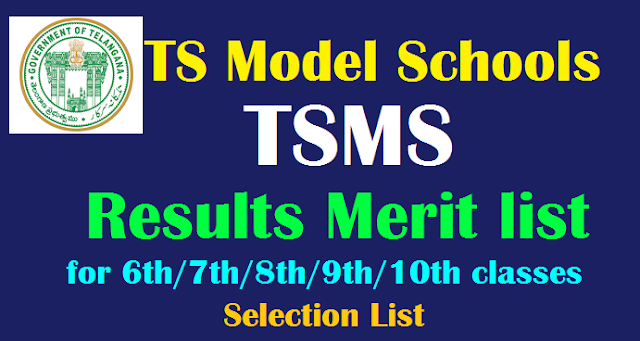 TSMSCET 2019 merit list.TS Model Schools Entrance Test 2019 Results/ TSMSCET 2019 merit list. TS Model Schools 6th /7th/8th/ 9th/10th classes Admission/Entrance Test 2019 Results/TSMCET 2019 Results, selected candidates list 2019, Certificates Verification Dates, Admission counselling dates details are given here. Telangana State Government, School Education Department, Rashtriya Madhyamik Shiksha Abhiyan has been released TSMS CET 2019 for admission into 6th/7th/8th/9th/10th Classes in Telangana Model Schools for the academic year 2019-2020. TS Model School admission notification released on 09.01.2019 for admission into 6th to 10th class English Medium. TS RMSA, Hyderabad invited the online application forms from the eligible students through telanganams.cgg.gov.in webportal from 01-02- 2019 to 08-03-2019. TSMS entrance exams were conducted on 18-04- 2019 at each mandal head quarters or model schools in all districts of Telangana State and exams held from 10.00 AM to 12.00 AM and for 2 to 4 pm for 7th to 10th classes as per schedule. Tags: TSMS Results, TSMSCET Results 2019, telanagana model school merit list, TS Model School Admission Test Results 2019, Tsms 6th class entrance 2019 results, Tsms admission test 2019 Seclected candidates list, telangana model schools 6th class entrance test 2019 results, tsms cet 2019 results,merit list, TSMS Official will publish of Merit list , Finalization of admission list at District level, and Certificates verification would be conducted for admissions into TS Model Schools and commencement of classes schedule announced at telanganams.cgg.gov.in.